I was content to sit on the pebbles, lit by the heatless fluorescence of the winter sun and enjoying the gothic charm of a guano-stuccoed West Pier. 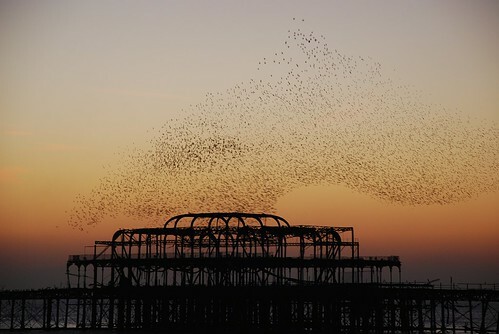 From nowhere, a squall of starlings began their roosting ritual, swinging across the sky with mesmeric elasticity. The sun’s race for the horizon accelerated and, with it, the tempo of the dance. The frenzy reached its pitch and then, as water eclipsed the sun, the sky emptied of birds and light. The Power, the first poem in Paul Farley‘s most recent collection, The Dark Film, opens with this moment. ‘Forget all that end-of the-pier / palm-reading stuff. Picture a seaside town / in your head. Start from its salt-wrack-rotten smells / and raise the lid of the world to change the light, / then go as far as you want: the ornament / of a promenade, the brilliant greys of gulls, / the weak grip of a crane in the arcades / you’ve built, ballrooms that come alive at night, / then a million-starling roost, an opulent / crumbling like cake icing…’ Farley’s language is direct and engaging, as the imperative ‘forget’ both empowers and disempowers, as our imaginations create the seaside town, but as a response to the will of the poet. In ‘wrack’, Farley provides a bass note deep enough to be felt rather than heard, as lurking around this word are punishment, enmity, worthlessness, evil and wrecked ships. Beneath the simplicity of the gulls’ greys and the amusement arcades lurks something indefinable. Nothing is quite as it seems in Farley’s world. We see ornaments but look closer. They crumble like cake icing. The concrete has cancer. 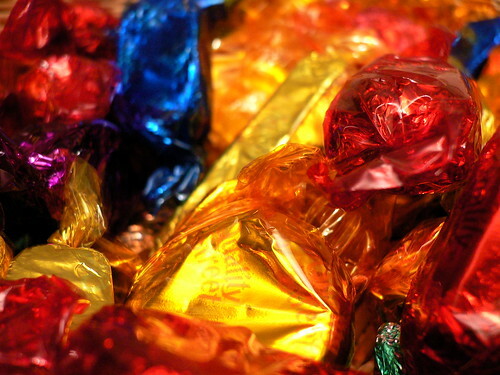 In Quality Street, Farley asks, ‘How many other kids would turn / themselves into a camera / replete with scrims and gels and tints / to see the world in new colours?’ Scrims and gels evoke the theatre and, like The Power, we are asked to consider differences in seeing. ‘The wrapper of a strawberry cream / unpeels a vivid red to dye / the evening bloody monochrome’. It might seem easy to dismiss Farley’s theatre of blood but, by the end of the stanza, a half rhymed couplet delivers a savage blow: ‘and when our sun becomes a swollen core / there will be other evenings like this to endure’. Christmas evenings of lazy excess, nursed through bad telly by the good offices of a tin of Quality Street are savaged by Farley’s black humour. Yes, a dog rifling the bins behind the maisonettes as we sit embalming ourselves with chocs really is as bad as the sun becoming a red giant in approximately 5 billion years time. Poem after poem, Farley’s observational skills are perfect. In Saturday Irons he riffs on the relationship between the adolescent male’s interest in domestic chores and his interest in girls. Speaking as someone who dropped a hot iron onto my parents’ living room carpet as a boy, this one resonated. ‘Irons became attractive to the boys / who’d formerly paid them not the least attention, / except to spit on them when set to COTTON. / A scent hung in the hall: mainsails and sea-spray. / A bimetallic click. 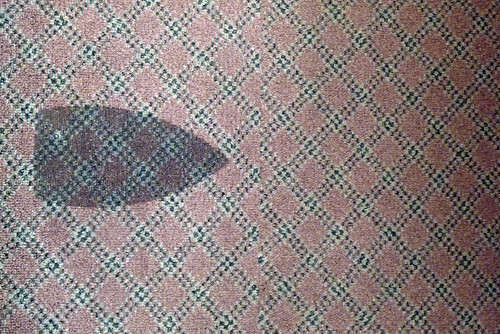 Things came to the boil // and so began the years of pressing creases / into a pair of slacks, or sharpening collars; / of green lights in the heels of ancient irons / meaning evenings were on; of fraying flexes / with a repeating diamond adder pattern’. Farley’s ‘mainsails and sea-spray’ reclaims the iron, a symbol of female oppression and used by The Women’s Press as their logo, as something manly, ship-shape and Bristol fashion. The tether of flex may have invited Farley to see the iron as an anchor but, having read his poem, I’ll forever see the dangerous curves at the iron’s prow as the ‘cleaving wing’ of Hardy’s Titanic. Chasms of time open up in Farley’s stanza breaks and, by the time we reach the final stanza, ‘The lights clicked off. Things shrank. The schools burned down. / The shirts were grown out of. Those irons sank / like dead-weights where they’d once steamed full ahead / across the wrinkled fabric of the world, / into the kitchen cupboard’s dark sea bed’. Farley’s ‘Things shrank’, is a precise observation of the tricks our minds’ pre-Copernican outlooks play on us: we project change outwards rather than recognising it in ourselves. Beneath this collection’s skin is a profound unease, of inquietude. We sense it in the change of perspective glimpsed through the wrapper of a strawberry cream and feel it in the low C of the sixty-four foot organ pipe of The Note Produced, ‘the low C, shuddering Jesus Christ, / the engine room that makes cathedrals / dive, dive, dive, fathoms of flue // that drill into the bedrock, shift / knuckles and long bones in the crypt’. In the war movies of childhood, the U-boat’s klaxon meant frenzied activity, red lights and death delivered by sound, by the depth charge’s concussive pulse. That pipe sits in isolation on the page in a stanza comprised of one couplet. It stands out. It doesn’t belong and Farley presents it drilling into the bedrock ‘and you can feel the bottom line / right where the ribs all congregate, / a shiver trapped and brought to life’. 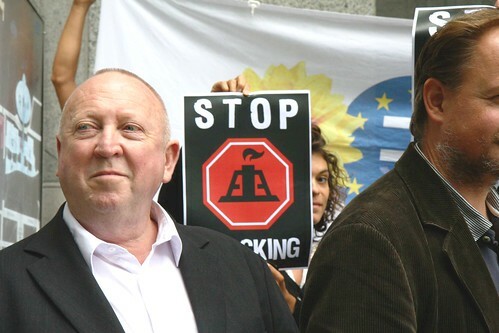 Paul Farley’s collection begins to look prophetic, as a ban on fracking for shale gas has just been lifted in the UK, despite the detection of two earthquakes near Blackpool in June 2011. The Dark Film is a superb collection. Farley’s work has a memorable, baroque, metaphysical beauty, yet it’s accessible, deceptively simple and powerful. His lens magnifies the details of modernity and, at scale, the cracks he reveals are unsettling. Buy The Dark Film from Picador.